A user was recently banned by blizzard for an unmentioned reasoning. So instead of him dealing with it, or just filing a normal petition to get back in, he tried something different. He drew them a picture of a unicorn. 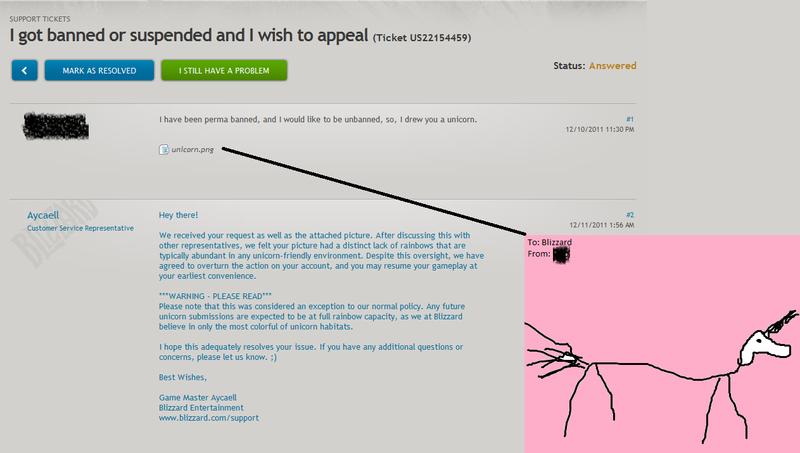 Blizzard then replied with nothing but unicorn talk and ultimately unbanned his account. Its not exactly told what he did in the first place to be banned, but for all you botters, cheating, and hackers that have been banned in the past this might be a way out. Just make sure to include a double rainbow in the background. Yea its pretty funny. Now he may of been banned for nothing big, but if it was for a bot that makes this all the greater. Too cool! LMAO Unicorn FTW!!! Probably fake but made me laugh hard. Need to go now, have to learn how to draw proper rainbows to get my accounts back. Reddit Starcraft users do this sort of thing. Pretty sure this one in particular is genuine.